It’s 8:37 and I’ve officially sat down for the first time today (if you don’t count the commute to and from work, which I don’t). After leaving the house at 7:00 am and returning home at 4:30 I proceeded to all the mom things I do every day: make dinner, pack lunches, play, read, check folders, baths and showers, bed time, etc. etc. etc. And now, at 8:37, after working a full day with East Baltimore 3rd graders, and coming home to my second (and most important full time job), I’m finally sitting down. What am I doing, you ask? Surely, I must be watching TV. Or cuddled up with my favorite book. Or simply going to bed early because I’m so freaking tired. No. Not any of those. I’m working again. Back to job number one. Though I’m now in my pajamas, sitting on the couch, the work is still piling up. creating a new seating chart because the green and red groups cannot seem to stop talking. EVER. And so on and so on and so on. And that’s just one day. There will be a different agenda tomorrow. I’m tired. And beat. And literally over it. No matter how much work I do during the day, I’m never done. I never get the glimpse of being caught up. And it’s not the stupid stuff like bulletin boards and birthday charts. Yes, those things matter, but only to a small extent. The stuff I’m talking about are the non-negotiables: things that are expected of me in this line of work and I have no choice if I complete them or not. This is my 7th year. You’d think my now I would have figured out the trick. I’m tenured. And seasoned. And experienced. But I still feel like I have no idea what I’m doing. I still haven’t learned how to get everything done. I still haven’t figured out how to NOT spend a million dollars a year on classroom supplies. I still haven’t figured out how to actually ENJOY my job on a daily basis. Smile…yes. Be present…yes. Enjoy…no. Maybe one day soon I’ll figure it out. Maybe this is the year I learn how to stay afloat. And as I reach down to pick up the first piece of grading, Charlie wakes up and beings throwing things out of her crib and talking loudly. Most teachers I know believe that this was their calling. They wanted to work with society’s youngest and most impressionable. They wanted to “make a difference” and “change the world”. The wanted to inspire and mold the next generation; the generation that would undoubtedly take over when they eventually perspired. This was not me. I never wanted to be a teacher. I started college as a pre-med student, wanting to be a surgeon first, then a medical research scientist. Once I discovered that chemistry and I would never be friends, I changed my major (to be honest, there were about 50 in-between) and picked up a dual degree in psychology and sociology. I was going to go to graduate school and do research about the world; why it was broken, and what I could do to fix it. Or I’d work at a non-profit. Or join the Peace Corps. 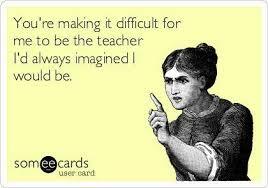 Eventually I would probably teach, but to the “big kids” and the grown-ups who had a choice about taking my class. But, as life has a way of showing us, it didn’t work out that way. My senior year of college brought forth: a disastrous internship at the Baltimore ACLU, the GRE’s, 9 grad school applications sent out (1 acceptance), and a part time job working at the pre-school on campus. It was there, working in the pre-K/kindergarten class, where I discovered my love of the little people; the tiny scholars who would one day change the world. I discovered beginning writing, circle time, centers, recess and story time. I discovered a lovely world full of hope and amazingness. And I also discovered something I was actually good at. I remember the exact day, sitting on the carpet with my “friends” and realizing that this is what I wanted to do…forever. I immediately found graduate schools education, got my M.Ed. in early childhood education, got certified, and embarked on my life path. I was ready to change the world, one five year old at a time. Fast forward to 6 years post grad school. I am no longer a teacher. Yes, I work at a public school in Baltimore. Yes, I am in a classroom. But I am no longer a teacher. I am a data analyst. I am a paper pusher. I am a photo copier. I am a lesson planner. I was hired to be a teacher, but I very rarely get to do my job. Beginning writing is now forced handwriting. Circle time and morning meeting (character and community building parts of the day) only happen if we can keep it under 10 minutes. Centers are nonexistent because I’m usually either still teaching my pre-prescribed scripted lessons from the district (yet still have to write multi-page lesson plans) or I am testing and the rest of the class has to do busy work. Recess? What’s that? We barely have time to look out the window to check the weather for our weather graph let alone go outside and PLAY. The other part of my day I get to be a bouncer and break up fights, stomp on sassy attitudes, and continually call and text parents of disrespectful students. Why? Because their ENTIRE day is one big structured minute after another and they get NO time to act their age. We can barely take a bathroom break without it interrupting too much instruction. And even then I could bet you that most of them don’t actually have to use it: they simply just want to get up and walk around for a minute and just be. But I have to get through it all. Whether they can do it or not. Whether we’re ready or not. Because if not, I’m the failure. Not them. Not the system. Not the district. Me. If I’m going to be completely honest, I think this may be the year I decide to not be a “teacher” anymore. It’s just too much and I can’t keep up with all the “extra” non-teaching things I have to do on a daily basis. I’ve said before that there is no way I can be an effective parent and an effective teacher and I whole heartedly believe that because by the time I get home after working a 8+ hour day I still have to make dinner, pack lunches, and spend quality time with three of my own little people. By the time I finally sit down at 9 pm to do the 2-3 hours of nightly work that I have before going back to school tomorrow, I AM DONE. So something gets dropped. We eat pizza instead of a healthy meal. I put on a movie so I can work. I just don’t get the school stuff done and I look bad. And once I’m caught up, the vicious cycle starts over and over and over again. There are lovely moments, don’t get me wrong. But that’s what they are – moments. Fleeting glimpses of what teaching used to be. Smiles and math manipulatives and bright-eyed understanding. And it’s always just enough to get me to think maybe it’s not so bad. Maybe I can keep doing this. Maybe I’m over reacting. But then I check my email. Or get a text from an administrator about something I forgot to do. And I realize there is no winning. Not for me, or my colleagues, or the students. There’s simply getting by. And I know this isn’t enough. Are we ever going to be able to just TEACH? Today was actually a good day. It’s hard to pinpoint what made it a good day, it just was. And the funniest part? School actually contributed to my good mood (somewhat). The morning started out like any other with the millions of children (I have 34) coming into the classroom for breakfast. We did our thing like always; we ate breakfast, changed to our leveled reading classes and continued about our morning. Nothing remarkable, nothing mood altering, just typical Wednesday. For the most part, everyone worked hard, everyone was respectful, and everyone walked out with a little bit more understanding of why character traits are important in a narrative. Then it was time to change back to our homeroom classes. This is usually a busy and loud time of day where I just feel like screaming “SIT DOWN AND BE QUIET FOR 5 MINUTES!” I stepped in the hall to talk to another teacher about a student when I slipped on something and went down hard. There were a quite a few students in the hall, but it was pretty anticlimactic. It didn’t hurt (though I have a giant bruise now). But what happened next did. Someone laughed. And not just someone. A child. An 8 year old laughed at me. And then I cried. I wasn’t crying because I fell, I was crying because an 8 year old was mean to me. Yes. I am 34 years old. Yes, this kind of disrespect happens at my school daily. Yes, I realize that kid’s opinion of me means nothing, but in that moment, my feelings were hurt. By a child. But then a funny thing happened. My entire class crowded around me. Through the chorus of “what’s wrong” and the many, many hugs I was able to tell them I fell and that while I wasn’t hurt, my feelings were hurt by another student. And they were upset. They were upset that someone would hurt me, even if it was just my feelings. But not today. I heard their concern. I saw their love. And for the first time I thought maybe I can do this for the next 100 days. Maybe we actually are getting somewhere. Maybe we actually are going to be OK. I was only at Collington Square Elementary for two weeks before contacting the local teacher union about transferring to a different school. This wasn’t what I signed up for, I constantly told myself. I had completed my student teaching at a technology magnet school in the “county”. My first few years of teaching were spent at a well-to-do private school on an island in South Carolina. My teacher education, while at a nationally renowned teaching university, had not prepared me for any of this; for the public schools of East Baltimore. As I drove up the streets to the school for my teaching interview, the boarded up buildings should have been my first clue that I was completely out of my comfort zone; that I was completely out of my element. My second clue should have come from the fact that I was hired immediately after a 1o minute interview. At the time I thought it was because I was “that good”. Now I know it was most likely because they were desperate. I knew this would be a challenge, but I didn’t care. I was an idealistic sociology and education major and I was ready to change the world. I’ve always liked a good challenge and I was ready to embrace this one with open arms. We heard teachers talk at the new teacher institute about things that were happening at Collington. They talked about fights, disrespectful students, children who didn’t have shoes, incarcerated parents, an uncaring and absent administration. I still thought I could handle this. But on the first day, I realized how wrong I was. I grew up poor, but this was POOR, in all capital letters. I wanted nothing more than to run out of the building and never look back. I wanted to find a cushy job in a place where I didn’t always have to feel like an outsider. Those of us that were new banded together like a club, while those that were “seasoned” merely put up with us expecting that many of us would not last. I was in way over my head. I was promised support. I was promised supplies. I was promised a safe environment. And while the school may have failed to provide me with any of these things, I was provided with so much more. I have gained a kind of confidence that can only come from being in the trenches of a war. True, my classroom is made up of the tiny friends of the school and we don’t have the same struggles the older classes have, but we do have our own. I’ve learned how to solve my own problems and know full well that no one is going to solve them for me. I’ve learned how to make something out of nothing. I’ve learned how to scour back to school ads for the best deals in supplies, because I’m the one who provides them for all 25 of my students throughout the year. I’ve learned how to negotiate for so many things. I’ve learned how to ask for what I want, even though I know I won’t get it. I now know how to not feel so intimidated, or at least how to hide it. I’ve lost the feeling that I always had, the feeling that I needed everyone to like me all the time. That’s not my job. My job is to teach, inspire, encourage, create, and mold…and at Collington, I’ve learned that I’m damn good at it. Every year I have the choice to leave and every year I make the choice to stay. I tell myself that it’s because I’m too tired or too lazy to find another job. And maybe that’s part of it. But really, I think I WANT to stay. Because at the end of the day, Collington is home and the people I work with are my family. Whether it’s the cousin I only see at random family gatherings or the sister I spend most of my days with, we are all a part of each other’s lives whether we want to be or not. For the most part, we have each other’s backs and no mater what, we are always going to do our best to make each other shine. We have to. Because when it comes down to it, all we have is each other. It’s time to embrace that, to hold hand, walk forward, and do what we can to create the change we want need to see. In the five years I’ve been at Collington the school hasn’t changed. We still have the parent issues, and student issues, and administration issues. The school hasn’t changed, but I have. And I’m ready to put that change to good use next year. Every day as a teacher (a kindergarten teacher in a fairly unsafe area of Baltimore, to be exact) there are so many things I wish I could tell the parents of my students. While I am teaching, I always think that I know better and wish that I could impart my amazing parental wisdom on the parents of my students. I want to tell them to let their kindergarteners be more autonomous. Don’t walk them to the classroom. Let them put away their own stuff. Don’t hover. Step back. Listen to them, but don’t believe everything they say. Let them be who they are. And many times, if I have a good relationship with them, I do say these things. But flash forward to today. It is my first day of maternity leave and one of the few chances I have ever had to take my child to school. We live in a “nice” neighborhood. My kids go to “nice” public schools. Nothing at all like where I teach. I feel like I have absolutely nothing to worry about. And yet, when I had to drop my kindergartener off in the carpool line today, and watch him walk the less than 100 feet to the front of the building, blind panic set in. He had to turn a corner where I wouldn’t see him. There are literally 12 teachers at their morning posts. And all I can think is “what if?” What if he trips and no one is there to help him? What if someone in line teases him and he gets sad? What if he gets distracted, doesn’t follow directions, and therefor gets in trouble? It took every ounce of restraint I had not to park the car and walk to the front of the building to check on him…to wait and hold his hand for the two minutes he was going to be in line before entering the school building. To give him one more kiss and hug so he knows someone on this planet thinks he’s amazing. I went to school for child development. I teach small children how to read and write and complete math problems every day. I try to instill in them a sense of purpose, a sense of kindness, and the ability to stand up for themselves and the things they know to be right. I am with them for 7 hours a day, 180 days a year. And I see how able and capable they are and what wonderful little people and citizens they have become. I let them run and grow and engage without hovering over them all day. And yet, that is what I do to my own child. I hover. ALL. THE. TIME. Maybe it stems from bad early school experiences for him. Maybe it stems from him being slightly weird or awkward. Maybe it stems from me being slightly weird and awkward as a child or not having very close relationships with my parents. I don’t know. But what I do know is that I am constantly yelling at my husband for hovering and I do the same thing. At the park. At home. In public. I know what I should be doing. I know I should stand back and let him just be “him”. And yet I don’t. Within the next few days, baby 3 will be joining us. There will be less time and attention for my other little ones and I keep having this panicking feeling that I didn’t teach them enough on how to be independent. 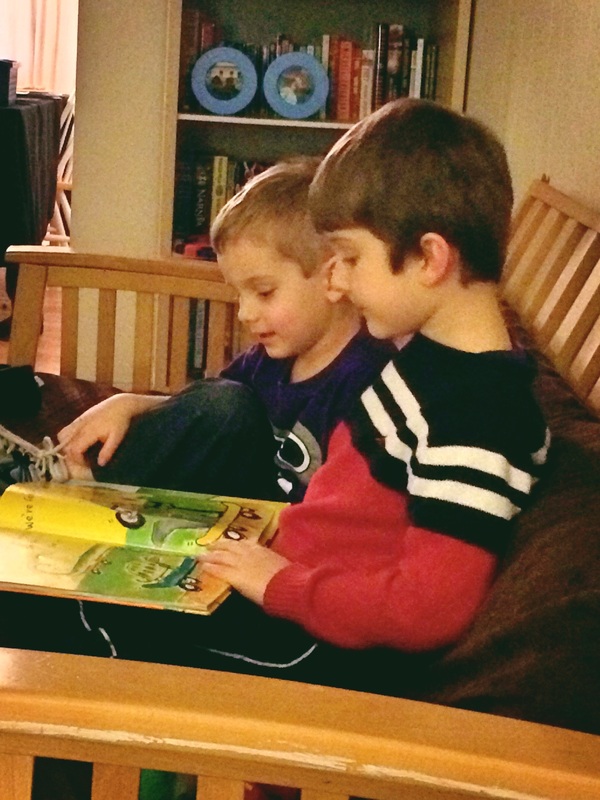 On learning to engage with other children. On what to do if someone teases you. On how to stick up for yourself. I worry and worry and worry constantly that I hovered too much and tried to control too much. And maybe, just maybe, it’s time for me to let go…so they can just be.